glenmorangie glass. Condition is Used. Dispatched with Royal Mail 2nd Class. Hope you get lucky and win. Ignore the blue tinge in the writing on the glass, it is all gold colour. Glenmorangie Tumbler Glass Dram . Condition is New. Dispatched with Royal Mail 2nd Class. A brand new Glenmorangie tumbler. Standing 8.8cm tall and a 6.7cm diameter This very rare and collectable crystal tumbler would enhance any bar,home,collection or make a super gift. classic whisky deserves a classic glass, which is why Glenmorangie has selected these high-quality tumblers to serve their single malts. Rounded and heavy-bottomed, they sit comfortably in the hand. Printed with the Glenmorangie name and the distillery’s emblem – inspired by carvings on the ancient Hilton of Cadboll Stone – these tumblers let the whisky speak for itself. X2 Glencairn Glenmorangie Single Highland Malt Scotch Whisky Glass. 1 GLENMORANGIE WHISKEY GLASS . THIS GLENMORANGIE WHISKEY GLASS HAS NOT BEEN USED , IT IS IN EXCELLENT CONDITION , NO SCUFFS SCRATCHES OR CHIPS . PLEASE CHECK THE PHOTOS FOR CONDITION I HOPE THAT THEY ARE HELPFUL THANK YOU FOR LOOKING . POST TO UK ONLY . 2 x New Glenmorangie tumblers Standing 8.8cm tall and a 6.7cm diameter These very rare and collectable tumblers would enhance any bar,home,collection or make a super gift. classic whisky deserves a classic glass, which is why Glenmorangie has selected these high-quality tumblers to serve their single malts. Rounded and heavy-bottomed, they sit comfortably in the hand. Printed with the Glenmorangie name and the distillery’s emblem – inspired by carvings on the ancient Hilton of Cadboll Stone – these tumblers let the whisky speak for itself. Glenmorangie Single Malt Scotch Whisky A Pair of Whisky Tumblers & Hip flask. GOLD LETTERING IN VERY GOOD CONDITION. Glenmorangie tumbler A classic whisky deserves a classic glass, which is why Glenmorangie has selected this high-quality tumbler to serve their single malts. Rounded and heavy-bottomed, it sits comfortably in the hand. Standing 8.9cm tall with a 6.7cm diameter and weighing a impressive 0.375kg. Very high quality, the heavy base gives a quality touch and finish. These very rare and collectable crystal tumblers would enhance any bar,home,collection or make a super gift. As pictured, in fab condition, and its a fab glass, could be Cristal but im not sure, 72mm tall, lease study pictures, item no 1234. GLENMORANGIE SCOTCH WHISKY - 3 TASTING / NOSING GLASSES Lovely set of 3 Glenmorangie Single Highland Malt Scotch Whisky glasses. Long stem style for tasting and nosing aroma. Gold lettering to sides. Pre owned but unused. Perfect for the whisky connoisseur. Thanks for viewing. Please visit our eBay shop for lots of similar items. BRUICHLADDICH single Highand Malt WHISKY TUMBLER GLASS. ETCHED EFFECT WRITING. Glenmorangie 'traditional' cask strength 100% proof whiskey empty bottle. Contents were thoroughly enjoyed and now missing! From smoke and pet free home UK bidders only . Dispatched with Royal Mail 2nd Class. Lovely glenmorangie whisky glass. Condition is New.name etched along lower section. Obvious when looking at it but difficult to photo. Nice shape to hold. Dispatched by courier. Happy to answer questions. Glenmorangie Single Highland Malt Whisky Hip Flask 3.5 Fl Oz Stainless Steel. You are looking at a GLENMORANGIE SINGLE MALT SCOTCH WHISKY CONNOISSEUR'S TASTING GLASS. This delightful little glass is ideal for nosing and tasting whisky and other spirits. Glenmorangie Single Highland Malt. Scotch Whisky Nosing Glass. Nice glass. Without box. The Glenmorangie Single Highland Malt Whiskey Tasting Glass. 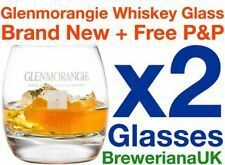 2 x Glenmorangie Whisky Tumblers boxed. Condition is New. Dispatched with Royal Mail 2nd Class. Glenmorangie Malt Whisky Glass - New & Perfect. Condition is New. Dispatched with Royal Mail 2nd Class. Empty Glenmorangie Single Highland Malt with Tasting Glass which has never been used. 2 x Glenmorangie tumblers A classic whisky deserves a classic glass, which is why Glenmorangie has selected this high-quality tumbler to serve their single malts. Rounded and heavy-bottomed, it sits comfortably in the hand. Standing 8.9cm tall with a 6.7cm diameter and weighing a impressive 0.375kg. Very high quality, the heavy base gives a quality touch and finish. These very rare and collectable crystal tumblers would enhance any bar,home,collection or make a super gift. Glennorangie single malt whisky glass. 2 NEW WHISKEY GLASSES EMBOSSED ' THE GLENMORANGIE SINGLE HIGHLAND MALT WHISKY ' 9 CMS HIGH. 7 CMS OPENING. 5 CMS BASE. NEW BUT UNBOXED. WATER JUG. I endeavor to take the best pictures I can of the item and most often include a ruler in the picture for sale. Stunning rare as a set. see pictures to really appreciate this set. Glenmorangie Glass Highland single malt Scotch Whisky Advertising dram glass. Glenmorangie Glass. Condition is New without box. Specially produced by Glenmorganie, Distillery Coy, Tain, Ross-Shire, Scotland. The ultimate professional Whisky tasting glass that is supplied with a matching glass lid which allows your dram to fully gather it's nose before you sample the delights within. About Hard To Find Whisky. Glenmorangie Limited Edition Open Golf 2013 Tumbler Dram. Condition is New. Dispatched with Royal Mail 2nd Class.